As we left Part 1 of the interview, Keith had left Peterborough and had joined up with former Sunderland team-mate Ian Porterfield at Bramall Lane. The challenge was to help lift the Blades, in the 4th Division for the first time in their history, back to the 3rd Division at the first attempt. "We made a slowish start, the addition of new players and the hangover from relegation for those who were still there. I think we lost a couple of games early on, but from October onwards we started to progress. The signings of Keith Edwards and Colin Morris were important. Keith had already scored past me, playing for Hull, earlier in the season. As you might imagine, knowing Keith, he didn't let me forget it!" Colin remains one of Keith's good friends now, visiting the former winger in his new home in Portugal. “I think we believed we were good for promotion when we beat Peterborough 4-0 at London Road in late April, we knew then that non-one was going to stop us. In fact we did the double over Peterborough that season winning 4-0 in our final home game to secure promotion. Keith also has a bad memory of that season. It was rare for 4th Division games to get much TV coverage, so when the Match of the Day cameras went to Layer Road, Colchester for United's visit hopes of putting on a show for the cameras must have been high. Things first started to go wrong when United had to play in the Colchester away kit, due to the sponsors on United's shirts not being allowed on television coverage at the time. As for the game…..
"I still have nightmares about the match. It was one of those games and it just had to be on Match of the Day. Nothing went right, I had an absolute stinker and we lost 5-2. I just couldn't bring myself to watch it that night. Afterwards Ian (Porterfield) was great. He said, "It is a one-off game, you have had a great season so far, put it behind you." I got clean sheets in the next two games which we both won 4-0 and the confidence came back quickly." 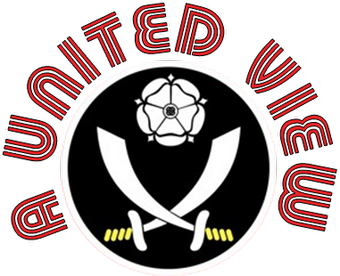 United had secured promotion by the time they travelled to Feethams, Darlington for the final game of the season in a match that has gone down in Blades folklore. "I have never played in a game like it. You would not have believed that you were playing away from home. United fans must have been on three sides of the ground, all in fancy dress. It was a real carnival atmosphere. We still had to remain focused though and despite all that was going on around us (fans were sat virtually on the touchline) we took the game really seriously. I remember Ian Porterfield telling us all, "We have got to win the league, we have come this far. Yes we are promoted, but promotion means nothing, unless we win the title."" With the 4th Division title in the bag, United carried great momentum into the following season. Sadly for Keith, injury was about to disrupt his plans. "I was playing in our final pre-season game at Lincoln and I broke my collarbone. It kept me out for three months and Steve Conroy started the season in goal. I tried coming back but it was too soon and I broke it again. It was a nightmare. After such a fantastic start at United, that second season was soured by that injury." Keith eventually returned to the first team in December and remained first choice until the end of the season, with United finishing 11th. "The season after I was back in and playing okay when I got an abscess on my leg, it was really horrendous and if I had landed on it, it would have been terrible. I missed a game and Tommo (Paul Tomlinson) came in and did really well. They kept him in the team and I never really got my place back." That season was a successful season for United as they were promoted for the second time in three years with a third place finish in Division Three, but it had been tough for Keith watching on from the side-lines after 16 league appearances at the start of the season. "After my injury setbacks in the second and third seasons I was determined to come back and win back my place the following season. I was really focused in pre-season and worked my guts out to be in tip top condition. I was absolutely flying. In pre-season Ian Porterfield said what was in the past was past and that he was going to pick the best player. For our opening league game versus Wolves I played which we drew 2-2. I was probably playing the best football of my career and then in mid-October we lost 3-0 to Boro and following that game he left me out. I was absolutely devastated. He didn’t even give me an explanation as to why he had left me out, nothing. I was so down, I was so gutted." After that Keith never really played for United again. Paul Tomlinson was back in the number 1 jersey and then the club signed John Burridge. The writing was on the wall, leaving Keith a disappointed man. "The end at United was so sad. I loved the place, the people, where we lived. My kids were born in the city. I had come to the realisation that I didn’t have a future there and would have to move on." "I went on loan to Cambridge to get games. My old United team-mate John Ryan had taken charge there and I had four games with them. Then I went to Bristol City on loan. They wanted to sign me, but the clubs were haggling about fees so I decided to sit it out til my contract was up in the summer." "City had gone from the 1st Division to the 4th and hit financial problems. Terry Cooper was steering them back and he was really good manager to work for; a fantastic, salt of the earth football man." Within 12 months at Ashton Gate Keith was to fulfil boyhood dreams and add a medal to his trophy cabinet. "In my first season at City we reached Wembley in the Freight Rover Trophy, beating Bolton Wanderers 3-0 in front of 60,000 fans. The fact that it was the Freight Rover Trophy didn't degrade it; I was playing at Wembley, a childhood dream." “We gave the fans a convincing win and what made it special for me was that my parents were there watching me; knowing how proud they were about it all. They had been brilliant throughout my career and I wouldn’t have achieved what I did without what my parents gave to me all the way through. It was a reward for them as much as it was for me. It was a magical experience; the best." "We returned the following year in the same competition, but lost on penalties to Mansfield. I made a conscious decision to go the same way for every penalty in the shoot-out. I reckoned on the law of averages they would put at least one down that side and I saved the second penalty from Keith Cassells and decided to keep going with it." In the end it was a former United team-mate who was to beat him with the winning penalty. "Yes, Mr Tony Kenworthy took their winning penalty and I was used to facing him in training for United. 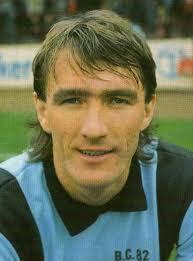 He was a great penalty taker and took all United’s penalties until Colin Morris took over. I've spoken with him since and I think he was really nervous, but they had twigged that I was going the same way each time. To be fair, I think he just closed his eyes and smashed it! I was gutted." It was Colin Morris’s final game for United and a great sign off. Meanwhile Keith was preparing for what should have been a two legged final versus Walsall. City lost the home leg 3-1, but then went to Fellows Park and won 2-0. In the absence of away goals counting the match went to a replay the following Bank Holiday Monday, again at Walsall. Sadly for Keith and City, the Saddlers ran out 4-0 winners. The 1988-89 season saw City close in on more knockout cup success, the 3rd Division side reaching the League Cup Semi Finals, only to lose 2-1 over two legs to Nottingham Forest. They were defeated only after an extra time defeat in the second leg at Ashton Gate. In Part 3 we look at Keith's decision to leave Bristol, his time at Coventry and Watford and a few reflections on his career and football today.